Discussion in 'Engine' started by gaz_l, Nov 7, 2018. I've seen a very nice CLK350 for sale, but I'm being put off by the M272 balancer shaft issue - the engine number puts it slap bang (no pun intended) in the chocolate balancer shaft gear section of the M272 engine problem venn diagram. geraldrobins, slade1 and clk320x like this. My CLK has the M272 motor, 72k and is wisper quiet. How many actually fail? My C230 has the 272 engine with 167.000 kms, on cold start it gives for half a second a rattling valve train and that's it. Runs smooth as silk not one drop of oilconsumption. I think that this only affects the earlier cars. Its a funny thing this timing chain thing- its not as if they haven't invented duplex chain/gears. 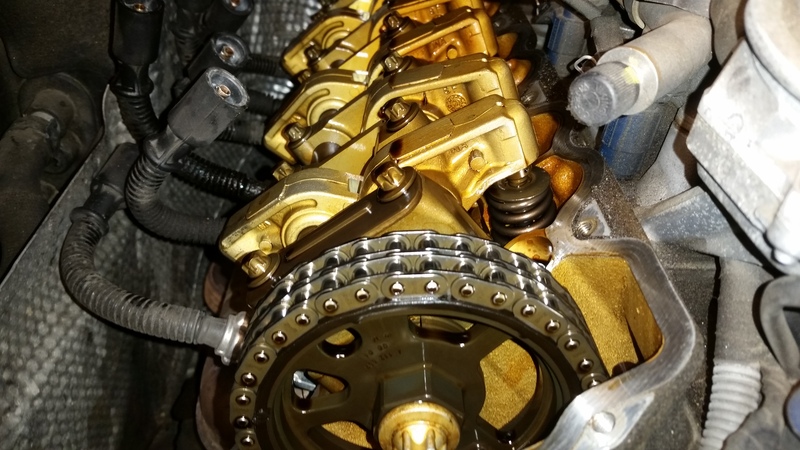 The adoption of a single row timing chain may have something to do with reduced timing gear friction and thus emissions/mpg. Maybe Ferrari got it right with timing belts and just accepting periodic renewal? If the engine no places the car in the danger zone and without documented evidence of timing gear repair I would tread carefully. I would suspect the early demise of the engines with the timing chain weakness may be be related to service history= adequate oil changes but possibly also influenced by previous owners willingness to take that silky V6 to the redline! If you are in no hurry to buy, wait there will be another around. I'm still looking for the right one after nearly two years have had the same urge to buy but I won't take the risk, missed what seemed to be a few good ones and still have an eye on a few others when time allows. Keep looking and wait for at least a late 2007 and check the engine number! I guess looking at it from a glass half full perspective this is the only thing that seems to go wrong on these engines, if it ever does. The design is an evolution of the M112 which never seemed to go wrong at all apart from the MAF. They use less fuel and are even quieter than the M112 as well. It’s probably about the same order of magnitude as a replacement turbo on a CDI in terms of cost and you get loads of warning. But yes if you find a slightly later one you wouldn’t even have to worry about this. The M112 was a single overhead cam [per bank] engine --------with DUPLEX chain timing gear! go figure! Which category is your engine in though? Ours in the 2nd (i.e. adjustment solenoids rather than the gear), 95k miles and (touch wood) OK so far. Engine numbers up to #2729..30 895140. The issue with the M272 is the balancer shafts, and you get the EML on when it happens. Replacement of the gears (worst case) is an engine-out job ... that's the category the OP's prospective car falls into. Group 1 is the big gamble as the cost to fix (if required) would effectively write a car off nowadays, unless you can do it yourself. The adjustment solenoids are not much of a problem really. You get a nice clear dtc when one goes, a genuine MB part is around £25 and it takes 15 min to change. Must be around £250 top whack to replace all 4, even if you don't do them yourself. (Doh, crossed with BTB's post above). Mine is a later one in the solenoid category. Owned over 6 years now, 80k on the clock and no issues. You do see some of the earlier cars for sale sometimes with stupidly high mileages, there was a CLS with 220k on the clock a few years ago. Actually - this will make you laugh - I'm now looking at an RX-8. As if I could buy anything with more potential engine problems. However, it's apparently just had an engine rebuild so I'm minded to buy it and just write the whole cost off mentally on day one. If it goes pear shaped 6 months down the line then it'll have been a bit of fun in the mean time. I know they've got no torque and all that but a 9000 rpm red line appeals.. I just checked on the CLK350 and it's sold before I can get to it, so that's one decision less to make!